Before students and staff flocked Main Campus for classes yesterday morning, a popular on-campus breakfast stop was robbed of approximately $250. 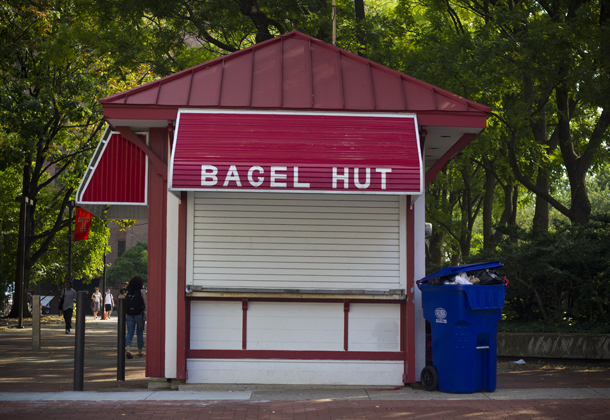 Bagel Hut owner Joann Ciallella said she was preparing to open her store shortly before 6:30 a.m. when a man came around the back of the hut, where the only entrance is located. “‘I’m here to rob you,’” she recalled him repeatedly saying after she told him that her store wasn’t open yet. Ciallella said the front gate for the hut, on Montgomery Avenue, between Broad and 13th streets, was still closed, but the side and back of the hut were open. The man told her he had to support his family and that he wasn’t going to hurt her, she said. Although she never saw a weapon, Ciallella said the man was fumbling in his back pocket, as if to imply he was carrying one. “I was nervous,” Ciallella said. She said she then opened the drawer and the man stole what police estimated to be about $250. Police were able to capture the man on surveillance videos as he fled the scene. The man is described as a white male, in his early 30s and approximately 5 foot 10 inches. At the time, he was wearing a black short-sleeve t-shirt, black pants, grey sneakers and a baseball hat. Following the incident, Ciallella said, she was brought to a police station and scoured through various mugshots, trying to match one to the robber, to no avail. In the meantime, police are searching for the culprit by talking to community members. Ciallella, who has been the owner of the Bagel Hut for approximately four years, said nothing like this has happened before. The previous owners operated the stand for about 18 years, she said. Read the full crime report from the Nov. 4 issue. How about contacting the police for a copy of the video, then posting a photo of the robber so members of the Temple community can see it and thus, keep an eye out for the thug? I thank God Joann was not hurt physically. I think it’s a shame that we have things like this going on here and people are not capable of defending themselves. The police are never around when a crime is committed so citizens and students should have the capability of defending themselves. Temple and Philadelphia need to start thinking about less restrictive gun laws as the neighborhood in and surrounding Temple University gets increasingly more dangerous! This place is unbelievable. I’ve never witnessed such rampant crime in such a condensed area. It seems like there are multiple shooting per week in North Philly alone. Someone please save North Philly. Goldman Sachs, MorganStanley please invest some of your CSR money here and turn this horrible place around!